This gorgeous full-color zine is a compilation project made by a group of eleven kids who attended the July Summer Zine Camp hosted by Sweet Candy Distro. Each child was given a word that they had to use in a sentence. After they put their sentences together to make a story, they illustrated their sentence page. It is a silly story about nature, survival, and a creepy old man. The kids voted on the title, too! 100% of the proceeds from this zine will go to the Sweet Candy Zine Camp Scholarship fund. Read about zine camp here. Black Indigenous Boy is a rad introduction to the two brothers behind this zine, Nehemiah and Havani. With their mom's support, these kids have created a zine to write about themselves, a glimpse into mental health, their love for drawings, comics and Star Wars. I love that this zine is printed in full color so you can appreciate the artwork! This teen perzine is about a 14-year-old girl who moves from a small city to a rural town and documents the challenges she faced adjusting to a new school. Sadly, she dealt with girl-hate and drama. Emily writes about some of the bullying situations she experienced along with a piece about a gross teacher. I was extra excited to find an issue of Hip Mama waiting for me in my mailbox. This issue RULES. The relaunch issue is incredibly satisfying to my soul. Inside there are pieces about the gross term "tramp stamp" and how Shell reclaimed the lower back tattoo, living in creative and tiny spaces, a behind the scenes look at school lunches, questioning the portrayal of Latina mamas, laws that affect wages & trans youth rights, and lots more - plus, a tattoo quiz, recipes, book reviews, and a zine spotlight. Get excited. This magazine is HOT. 11-year-old zinester, Bella (When Cats Attack) is back with a new cat zine, but this time she has written about her guinea pig, Ruby, and how she introduced Ruby to her two cats, Luna and Newt. Bella shares her concerns about the animals mingling, but also writes about the good things. She ends the zine with some solid tips on how to introduce cats & guinea pigs to each other. Alejandro was an 11-year-old student in my summer zine camp for kids. He instantly blew my mind with his talent. One of the zines he made during camp was How To Draw a Favorite Anime Character. With clean handwriting and dynamic drawings, Alejandro teaches us how to draw an anime character in 5 easy steps. He does include a bonus page - expressions for the characters! Another amazing zine made by Alejandro. In 5 hilarious and detailed steps, this young man has created a mini how-to on how to eat sushi. Alejandro's drawings are on point and he even snuck in a little mixed media. Love this - get this! This mini zine is extra enjoyable because it is printed in full color! Heath is an 8-year-old who created The Life of Poop Man on the fly while at zine camp this summer. Poop man has a son who is lost, so he goes on a quest/adventure to find him. There is a weird twist at the end. You'll need to read it to find out what happens to poop man and his son! All drawings are by Heath and he typed the text on an electric typewriter! Emily is a sixth grade student who felt like she had some good tips for middle school students. In her first zine in five years, 11-year-old Emily has compiled a guide including basic survival tips, how to deal with bullies, locker combination tutorial, her school version of the 12 Days of Xmas and a few brief stories. I wish I had this as a kid! I had the pleasure of having 9-year-old Olivia as one of my summer zine camp attendees. She is a natural born zine maker. I loved watching her in creative action. All About Animals - Okay, not technically a how-to zine, but it is full of info about pigs, ducks, wolves, monkeys, and dogs. Full color! How to Make a Popsicle - In 6 easy steps, Olivia walks you through making and enjoying homemade blueberry-banana popsicles. Full color! How to Make a Spirograph Patter for Starters - With a supply list and 4 steps, Olivia will teach this cool art form, and you'll be spiraling out all day long. Full color! More zines by the creative wonder known as Olivia! Creepy Stalker Frog - A super short story about stalking and consent! Full color! Harold, the hidden bunny - A fun hide and seek story featuring two bunnies, Harold and Carol. Full Color! Cool Spirograph Patterns - A gorgeous art zine using a spirograph - full color! zine is a dedication to her love for Olympia, Washington. She breaks up her Oly adoration into a few topics: community, food, and art! Emily tells readers why Olympia is a great place to be a teen! See also: My Survival Guide to Middle School, Come As You Are ... Or Not! Each flip of the colorful pages warms my parenting heart. 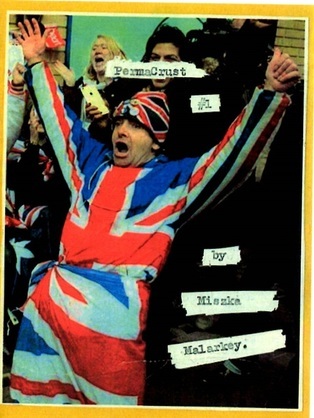 I relate to the humor, the exhaustion, and the ridiculousness that Miszka shares in her first issue of Permacrust. I laugh in solidarity with this mama as she shares her world. From the intro: "This is a zine about being an aging crusty punk & a stay-at-home mom in a new town." "When strangers tell you how beautiful your child is, and you're holding your breath til the next tantrum." Bella is 8-years-old and has a cat named Luna. She has recently discovered that if you watch a cat's body language, you can tell when the cat is angry. Bella has included seven signs in her mini zine to help you identify when a cat is about to bite you. A quick, fun, and informative read for all ages! Be afraid, be very afraid: it’s When Cat’s Attack Part 2!! Have you ever wondered what makes cats attack you? 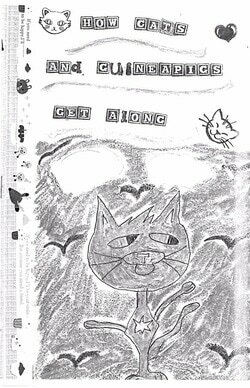 In this handwritten mini zine, Bella shares all of the tips you’ll ever need to avoid an angry or sneaky cat. She is a serious cat expert and possibly the wisest 10 year-old I know.